This was the first US Mother’s Day without my mom, who had ovarian cancer and died in November. Last week was rough. May 8th was World Ovarian Cancer Day and May 11th US Mother’s Day. Seeing everyone posting photos of celebrations with mom was really difficult. I know many of you reading this understand, because you have also lost your mom. I spent the weekend doing my best to occupy myself with other things, such as painting, moving furniture, and shopping. I finally did something with the spare room that has been empty since we moved into this house seven years ago: it is now my crafting room. Did I tell you the FORCE jewelry fundraiser lead me to start my own business? 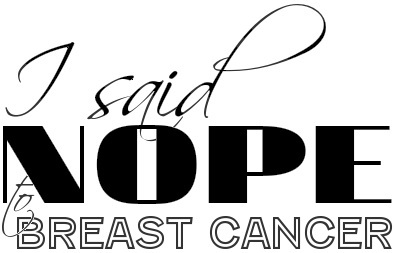 Yup .. nope2BC – Saying NOPE to Breast Cancer. Come see and Like on Facebook. I am making and selling cancer awareness themed jewelry and donating all proceeds to FORCE. I opened an Etsy shop and have also participated in a few local craft fairs and art expos. Over $1,000 has already been raised, which is way more than I expected to make in such a short period of time. I am ecstatic that it has done so well! I have another event tonight and many more coming later this year. I have lost count! Five weeks after my most recent surgery I finally had my first expansion. We added 50ccs to the expander on my left, for a total of 350ccs. Our goal is 550ccs, so four more expansions to go. My exchange surgery is scheduled for August 19. We are going to be cutting it close with only about four weeks between last expansion and exchange. If I wuss out again and need to lower the expansion volume, I will have to push the surgery into September. Just two days after the fill, I am sore, but it is no surprise. Next expansion: May 30. This entry was posted in All, Complication City and tagged BRCA, Breast implants, breast reconstruction, Exchange Surgery, HBOC, health, Necrosis, nope2BC, Previvor, Prophylactic mastectomy, Tissue expanders on May 16, 2014 by nope2BC. you still got a chance..